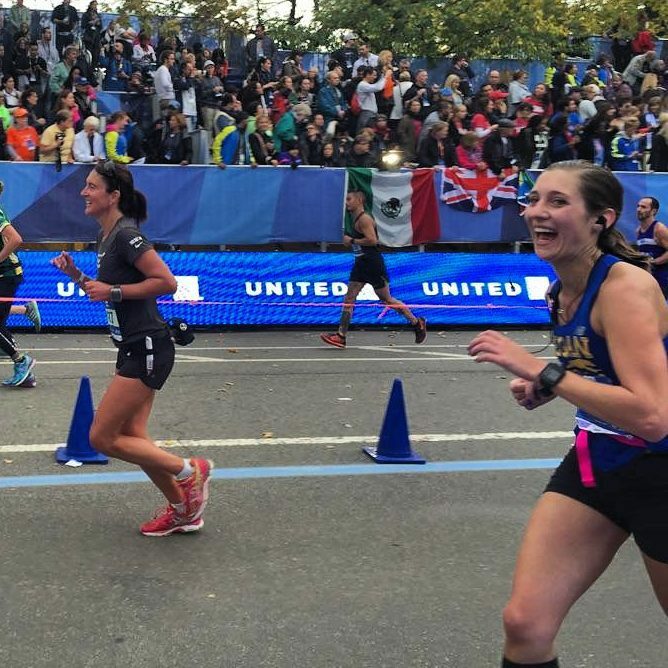 Megan Jones was asked to recap her marathon experience after running the TCS NYC Marathon (It is one of the toughest major courses in the world). What makes this even more special is that it is her very first marathon and she has Boston Qualified in almost 5 minutes required to run in 2017! So there’s that saying “it’s not a sprint, it’s a marathon...” And now I know exactly how much prep work, course research, training, stretching, recovering, acupuncture, hydrating, eating and sleeping—training for a marathon entails. I started my training cycle end of June, coming off a fractured toe injury (Not running related, I just can’t walk down stairs). That said, I had to ease back into running slowly and made sure to cross-train to get cardio in and not aggravate my toe so it could heal proper. Growing up a putz—I’ve learned the importance of lettings things heal. My training plan was just a little different from the actual whippets plan, I ended up doing much longer long runs. This was to work on my endurance and time on my feet. Also a HUGE part of my training that probably made race day successful was hills, hills, oh and more hills–during EVERY SINGLE long run–at the middle, at the end and any other chance I had to get a hill in. I would also plan my long runs based around the course so the more familiar I was with every single turn by turn–the better. I hardly ever run in Queens–and the whippets metric marathon was an good preview of that part of the course. I also made sure to focus on fueling properly during my long runs and getting as familiar as possible with how I would feel if I needed a gel, or gatorade, or just a water. I can’t explain the science behind this but I would ask myself if I was just thirsty or if I needed more and was feeling sluggish then gel. If my fingers would puff up then I knew I had too much salt then needed more water. So the week of I had been hydrating a bit extra and carb-o-loaded the night before having meatballs and pasta. My gear: – Sneakers – Adidas “Boston edition Adios” – Adidas sport socks – Whippet singlet – with my name applied on it – Lululemon shorts – Nathan Mirage Pak – for my gels – CEP compression calf sleeves – Adidas techfit sports bra (Tip for the ladies – this is by far my favorite because it does not have side seams, it has princess seaming – which means I have never gotten the under arm chafe from these bras). Got to sleep until 7:00am! This is one of the few races that is SUPER easy for me to get to. Had an english muffin with peanut butter and a little bit of coffee before I left the house. Get to the start village at around 8:00am. Drank a bottle of water and then a bottle of UCAN exactly 20 mins before the race. Made some friends in my corral, had to pee 3 times, and then before I knew it we were walking up to the starting line! Walking to the starting line I see another whippet, who I didn’t know–I made a new friend! Waiting… And then, ready set – BANG – GO! I put on my playlist that I had strategically made so that it was exactly as long as what I thought was an out of reach goal time of 3:30. Planning that when the music stopped I knew I needed to kick it up or watch that goal pass. I started the play list with slower songs and tried to just focus on my form and make sure I wasn’t using any more energy than I needed. Telling my self head up, back straight, shoulders out of my ears, and I just kept thinking relax and calm. The 2nd song was one of my grandfather’s favorites, I wanted to hear on the Verrazano Bridge because my other grandfather was an iron worker who helped build it in the 1960’s. Dedicating those first 2 miles to those 2 late great men Mr. Jones and Mr. DeRosa. So again the mind set: totally focused, calm and this sense of peace. I also knew I wanted mile 1 to be one of my slowest, and that mile 2 would potentially be my fastest. Check! Once off the bridge I knew I had someone cheering for me a mile 7, so keep calm make it to them with out breaking a sweat oh and run the tangents! I keep looking ahead to pay attention to where I could cut every single corner, also paying attention to whether or not it was an up hill or a down hill to take advantage of anything gravity would give. I wanted to stabilize my pace by the 5k mark and not only stick with it but be as comfortable as possible at that pace. I took my 1st gel between 6 & 7 because I preferred to take it earlier than too late. Saw my friend! She missed me though LOL. Then I knew my parents were supposed to be at around mile 9, right by Pratt (where I went to college). Knowing exactly where that was, I was pumped to get there! No parents—they stopped for coffee and missed me, typical. But my sister was there with a big sign, but I didn’t have a chance to read it. Then I knew at that part of the course the turns were coming and to focus on the corners. I saw a runner aiding a wheel chair–going as fast as me, I just couldn’t believe how amazing this guy was and what a superb of a job he was doing! He was making it look so easy. I had volunteered with the Muscular Dystrophy Association in the past and the thought of how fortunate I was to be in good health and to be able to run a marathon on my own, this became beyond inspiring. I decide to ignore my watch and just run a comfortable race and try to make it look just as easy as this guy was! FINALLY getting out of Brooklyn… And apparently I missed my sister here! Thought ahhh so Queens is kind of nice… and then DAMN there was a lot of people at turn of the base of the 59th st bridge! Mile 17 split = 8:03 Took my 3rd gel, and got to see my best friend waiting at the turn off the bridge! Super hyped at this point! That sponge was amazing! I had totally forgotten they gave these out! Took my 4th gel, and I vaguely remember thinking–where the hell am I? Nothing looks familiar… Ahhh thats because I’m in the Bronx and it’s not for a Yankee game. The whippets cheering station! Was beyond amazing! It gave me chills, even though I was way far from their side, it didn’t matter because it seemed like it was whippets for a 1/2 mile long and that was awesome! Saw my sister again here! Took my 5th gel. Officially now at this point, it was the furthest I have ever ran in my life! Also saw a few whippets along the way, which helped me stay on pace—even though I really, really, really had to pee—but I wasn’t stopping for anything. Around here is where my playlist glitched–and started over, and the sinking thought of oh no I’m not gonna make my goal came over me, but then I realize the last 5 songs never played. AND then a few seconds after this mishap, I saw my sister again! Had no idea how she made it there so quick! She kinda scared the crap out of me this time though she was beyond excited and cheering – she was like freaking out… So at that point I look at my watch and try to process what it actually said and realized WHOA even if I slow down I think I can maybe, just maybe BQ?! Flew down cat hill–LOVING every second of it because I knew I didn’t have to turn around and do a repeat of it!! Central Park was amazing! So many people screaming my name! But I couldn’t focus to see if I knew them or not–I just kept going. Telling myself head up, shoulders down almost there! So then this weird thing happened–I didn’t see anything around me I was spotting the top of columbus circle from the exit of the park all the way to the re-entry. Which is where I missed my parents who this time saw me. Then once I got back in the park–oh GOD WHY does this have to end on an up hill?! But then I though: just pretend like I was running late to a Tuesday night whippet practice and run to the 72nd transverse fast! Mile 26.41 split pace = 8:00/mi (according to my Garmin) Then saw another whippet in the grandstands as I approach the finish line which was an awesome extra kick to the finish! Gave Ciaccia a high five and was like YES!! I DID IT!! I Finished! Official race time: 3:30:53–when they put the metal on me, I cried a little in disbelief that I not only just finished my first marathon! In under 4 hours! But In 3:30:53!! I had just achieved a qualifying time for Boston 2017 (Boston Qualifying time for my age group is 3:35:00) !!! Absolutely no pain during the race, AND thanks to all the hills the only incline I felt was in Central Park up to the finish. Also other than seeing my sister multiple times. I saw Elizabeth Maiuolo cheering at 3 different spots on the course! But for the life of me I can’t remember exactly where but each time was an amazing surprise and extra boost!